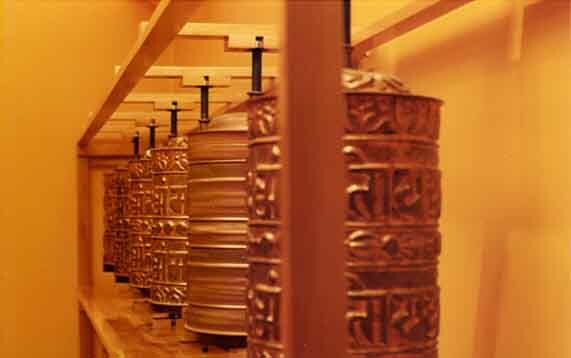 Tengye Ling Tibetan Buddhist Temple was founded in 1990 by Venerable Lama Tenzin Kalsang at the request of Venerable Tara Tulku Rinpoche. 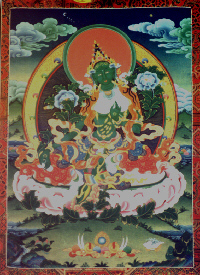 Tara Tulku Rinpoche is the Abbot of Gyuto Tantric College. 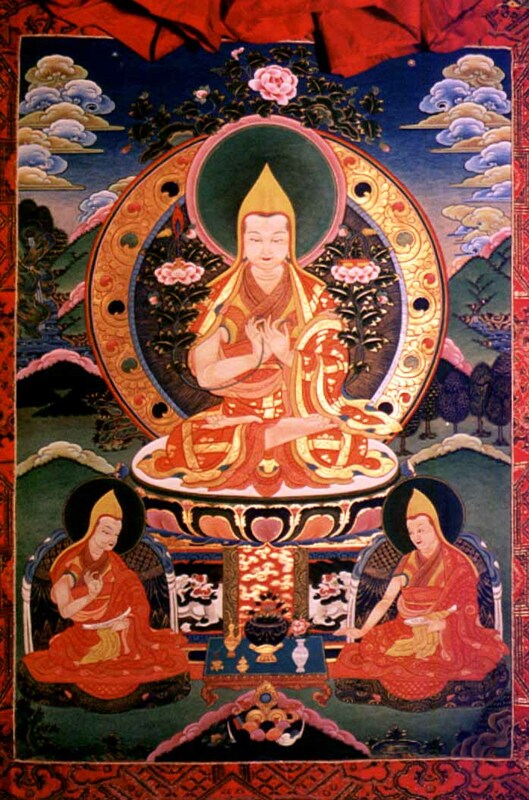 He was holder of the highest position in the Geluk-Pa lineage, the Ganden Tripa, throne seat of the lineage founder Lama Tsong Khapa. 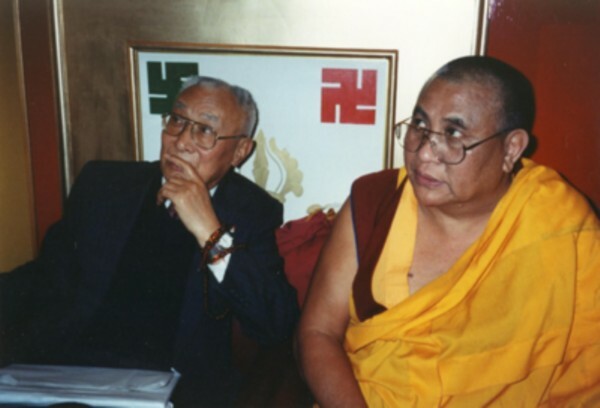 Tengye Ling was inaugurated in 1997 by the elder brother of His Holiness The Dalai Lama, Takster Rinpoche/Thupten Jigme Norbu, Abbot of Kumbum Monastery with the Venerable Khenpo Khensur Rinpoche, former Abbot of Namgyal Monastery. 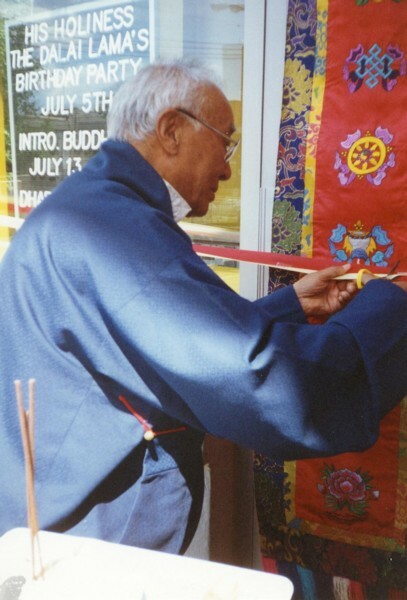 Takster Rinpoche cuts the red ribbon during the inauguration of Tengye Ling. VEN. 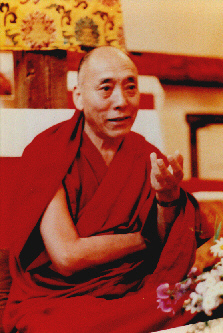 LAMA TENZIN KALSANG was born in the small town of Kenora, Ontario, Canada in 1939. She acquired a B.A. from Wilfred Laurier University with a major in Religion and Culture. 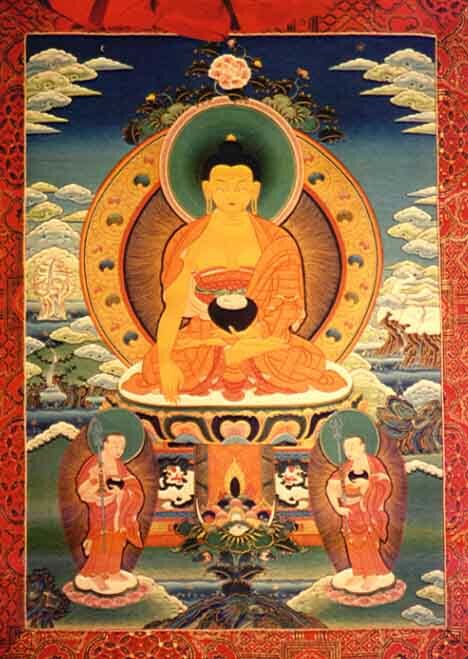 "Gen-la" (Venerable Teacher) grew up with strong devotion to Jesus which evolved, through an intense psychological and spiritual transformation, into an even deeper devotion to The Buddha. Unofficially, she considers herself to be an Interfaith person, appreciating the value in all religions. 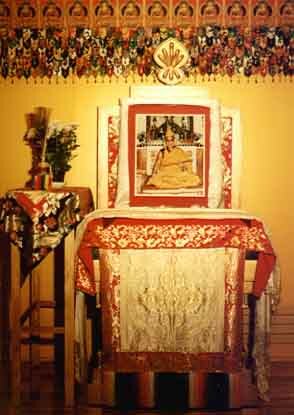 Gen-la was ordained in India by HIS HOLINESS THE 14th DALAI LAMA and ordained by MASTER HSING YUN. 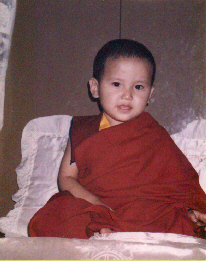 She is a fully ordained Tibetan Buddhist Nun and she is a devoted disciple of HIS HOLINESS THE DALAI LAMA. Ven. 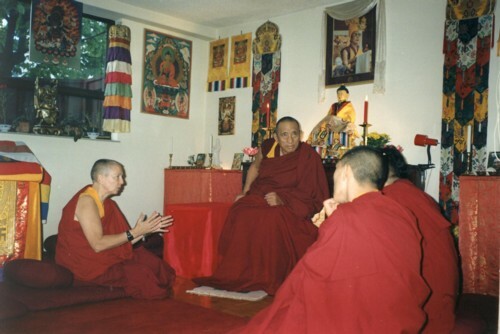 Lama Tenzin Kalsang is the Founder, Abbess, and lifetime Spiritual Director and Teacher of TENGYE LING TIBETAN BUDDHIST TEMPLE located at 11 Madison Avenue, Toronto, Ontario. 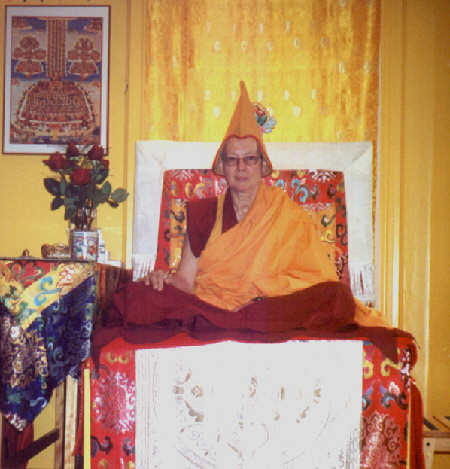 Gen-la has served as the senior female Teacher and advisor to 100 nuns at Thukche Choling Monastery Nunnery in Kathmandu, Nepal. 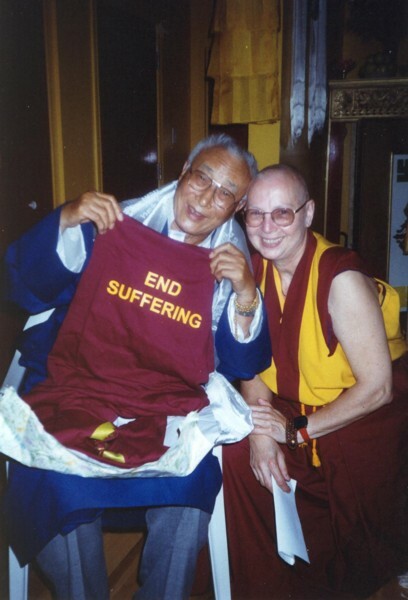 Gen-la has innovated Buddhist therapy. 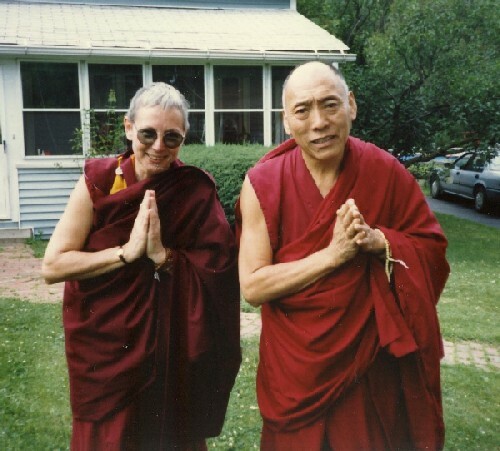 She is practicing Buddhist Therapy of Loving Kindness, being a nun in the Gelug-pa Tibetan Buddhist Tradition, ordained by HIS HOLINESS THE DALAI LAMA. Gen-la counsels her students both individually and within a group context. Ven. 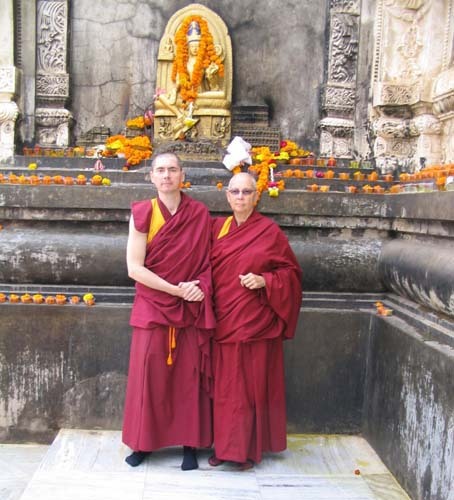 Lama Tenzin Kalsang receiving Teachings on Sunyata from the Abbot of Ganden Jangtse Monastery, Ven. 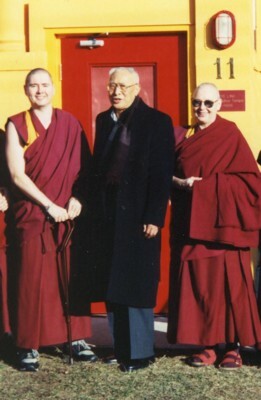 Lama Namda Khentul Rinpoche's monastery. Ven. 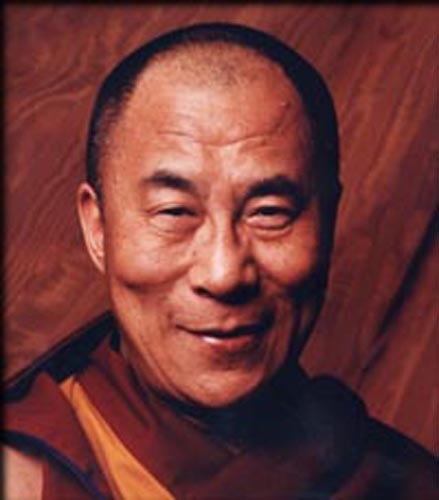 Lama Tenzin Kalsang has served as the Buddhist representative on the Ontario Multifaith Council of Spiritual and Religious Care since 1987. 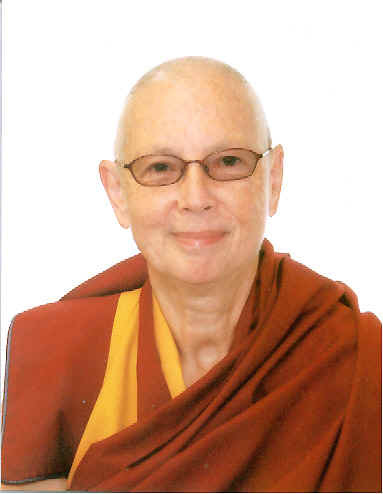 She is author of the Buddhist section in the Multifaith Information Manual, which is widely distributed in Canada and the U.S.
Gen-la is past Executive Vice-President of the Sangha Council of Ontario Buddhist Ministry and is past Secretary for the Buddhist Council of Canada. 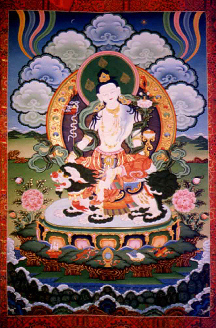 Gen-la has made Tengye Ling Tibetan Buddhist Temple the first Buddhist representation in the illustrious North American Interfaith Network located in the U.S.
Gen-la teaches Buddhism in English, with a rich North American background, at the Temple; at the kindergarten, public, high school and university levels; to special interest groups, and; to all faith communities. All activities are under the direction of our Spiritual Director. 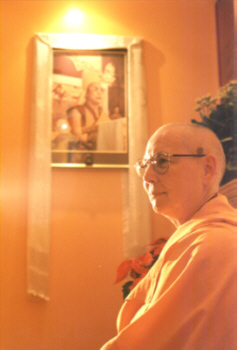 She is a genuine Dharma practitioner whose Teachings are based on her personal experience. 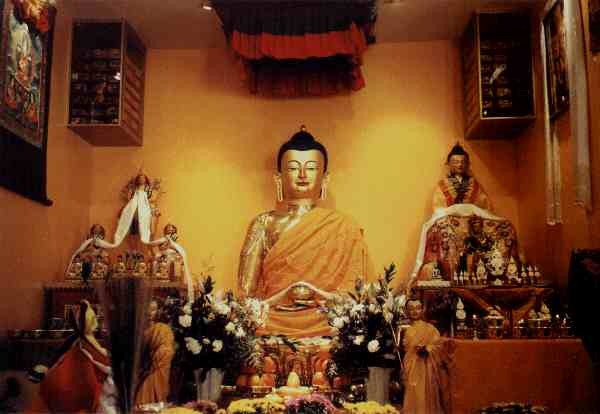 This experience has enabled her to penetrate the meaning of the Buddhist scriptures, thus, bridging the gap between the Western experience and the Eastern psychology/philosophy of Buddhism. 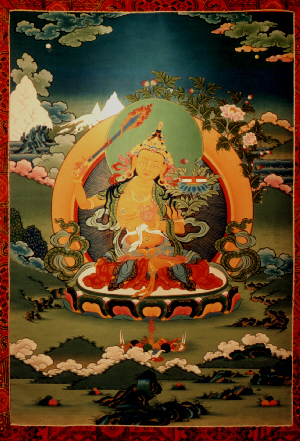 She is a devoted disciple of His Holiness The Dalai Lama. 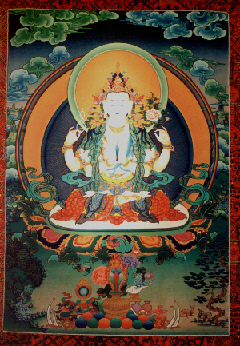 a kind heart, compassion for all beings, and wisdom.